The Secura RFID blocking anti-theft convertipack is much more than a backpack. This well made bag can be worn as a shoulder tote, a cross-body bag, or a backpack. From Lewis N. Clark, with their wonderful products, this one has turned out to be even handier than expected. Three bags in one. You can’t go wrong with that. Useful for all varieties of events from shopping to hiking to travel, it helps you stay organized and much more secure. The compartments are spacious. Plenty of room for your tablet or e-reader, your phone, cords etc, it also has the important safety feature of the RFID technology to guard your ID and credit cards. Another fine security feature is the easy clasp that can secure the bag to a chair. Besides that handy feature, the strap has a steel cable running through it, so it can’t be slashed through. Great to know it is safe while dining or enjoying a coffee or cocktail. Made from a soft nylon it is wonderfully comfortable to wear and use. 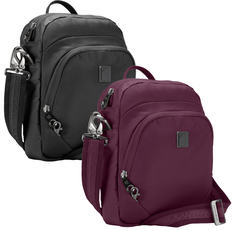 Unlike many bags with sharp edges or stiff material, you will find this one soft and nicely padded. In the photo to the left you can see the outside section that opens to hold items you prefer to have easily accessible. The one above shows how spacious it is. The credit card section has the RFID protection. You can see the spaces and zippered sections on the video below. Very roomy with enough dividers to keep things in place. I picked the wine colored bag. It is also available in black. So many features to appreciate. Give one a try. I’m sure you will be pleased with the product. You can order it here, at the Lewis N Clark website. I so enjoy the products from Lewis N Clark. The comfort, roominess, and security all contribute to that. Very well made!